Alessia Crea was born in 1982 in Calabria, where she grew up and attended the liceo classico. After obtaining her high school diploma, she moved to Sicily where she completed a Bachelors of Laws. Working with the seamstresses of her city, already at a young age she realized her first clothes to explore her passion for creativity. Alessia moved to Milan in 2005, and in 2008 she graduated from the European Institute of Design. While she was a second year student at IED, she took her first steps in the fashion world. Upon graduation, Alessia joined Costume National’s team as an assistant designer for men and women accessories. In March 2009 she took up a new challenge at Moi Multiple, a young Italian brand, where she designed luxury pret-a-porter for two years. In November of 2010, she won the Next Generation Contest organized by Cameramoda and had the opportunity to show her collection in Milan during fashion week S/S 2011. In September 2011 she won another competition organized by Cameramoda and DHL Express and her S/S 2012 collection was the protagonist of a show during the fashion week in Milan. In 2010 she founded with her partner, David Parisi, a man/woman brand, “Casamadre’. The name is inspired by a strong sense of belonging, by a relentless search for a contact with nature and with their origins, the fundamental values that are reflected in all the work produced by the designers. Alessia and David’s Casamadre won the WHO IS ON NEXT competition at the 84th edition of Pitti in Florence with their footwear collection inspired by ancient circus. Since March 2011 Alessia has been working as a freelance clothing designer for some companies in the Italian fashion scene, and is currently senior designer at a leading Italian luxury footwear brand. She teaches at IED moda lab in Milan and supervises students’ thesis. David Paris is a young Italian designer, born in 1979. He completed his studies at the Istituto Europeo di Design (IED) with a focus on industrial design. After his graduation, he started working as a freelance designer for brands such as Algida and in 2005 was awarded the Unilever prize for Young Emerging Designers. In 2007, he exhibited some of his works during the Fuorisalone, one of the side events of Milan Design Week. Those works were subsequently selected by the Italian Consulate for an exhibition on Italian Young Designers in Manchester. About the life of a product after his creation, David decided to go back to university and in 2008 completed a Master’s Degree in Fashion Communication at IED. Since then, he worked as accessories cool hunter, visual merchandiser, stylist and PR manager at Karla Otto; and as designer and art director at Independentideas - Italia Independent, where he designed the ready-to-wear and accessories collections and managed projects in partnership with Ferrari, Smeg, Blackberry, Arfango, Pantofola d’Oro. In 2013, he co-founded CASAMADRE together with Alessia Crea. 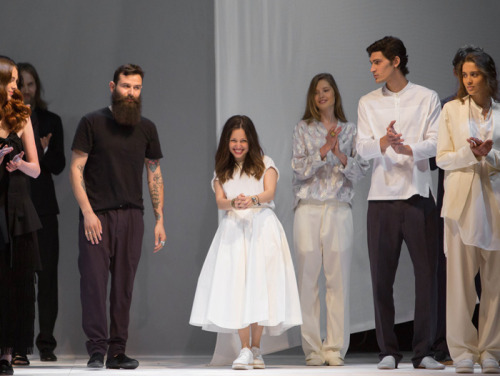 CASAMADRE, a Men & Women Fashion Brand, was awarded the WHO IS ON NEXT?2013 prize at the 84th edition of Pitti Uomo in Florence. The world of CASAMADRE includes also Laboratorio Casamadre, a creative platform for strategic consulting and brand/product development, which aims to help and support artists and creative minds from the fashion world and beyond. David is currently a lecturer at the Istituto Europeo di Design.